1 Preheat oven to 150ºC, gas mark 2. Roll out pastry to 2-3mm and set into 5cm pastry case moulds, press another pastry case on top and fill with baking beans. Bake for 15- 25 minutes or until golden brown, turn out of the moulds and leave to cool in the oven. 2 When cool, fill with chopped salad onions, chives and smoked salmon. 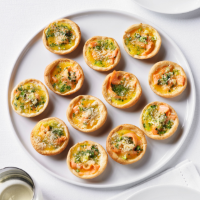 Mix together the egg yolks and the double cream and pour into the tartlets. 3 Increase the oven temperature to 180°C, gas mark 4. Sprinkle with Parmigiano Reggiano and bake for a further 5 minutes, but keep watching them, as they can explode! Serve warm.